I may have just figured out why there's such a massive disconnect between me and most people (in particular gay guys but also applicable to other scenarios): Fashion. I don't dress like them. The number of people who dress and act similarly is staggering. I just watched a gay couple holding hands go by wearing nearly identically fashioned outfits. 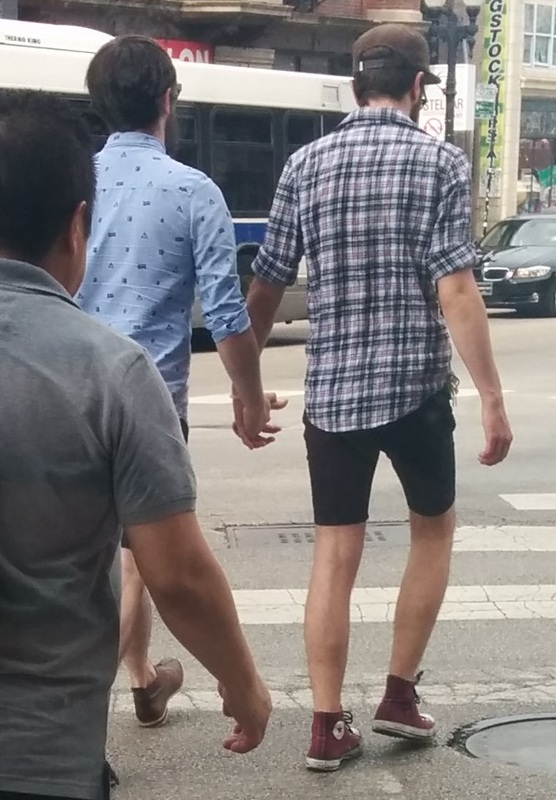 Both high shorts, thin shoes, similarly styled button-up shirts, and even beards and glasses of a similar style and length. Then I thought back to the other night when I was passing by the gayborhoods bar area and recalled that many of the people who were there and talking to each other were all wearing and acting very similar to each other. My fashion sense was frozen back when loosefit jeans and simple tshirt were casual dress. I've never worn a suit and can count on one hand the number of times I've worn shorts. Even button up shirts are very rare to me (I dislike how they split open to expose skin, get untucked and hard to put back in place, and strongly dislike the idea of wearing an undershirt (talk about hot and uncomfortable). 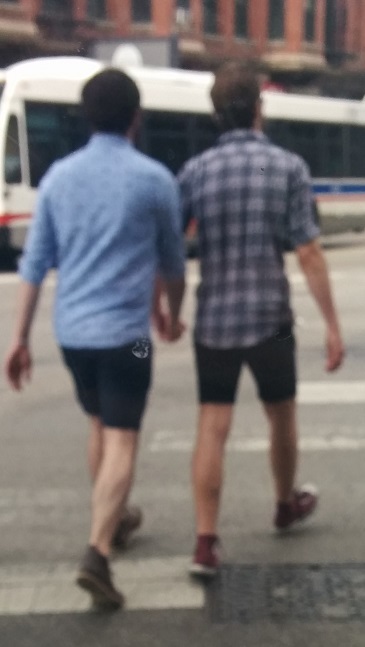 When I initially saw them holding hands I thought it was rather cute so I tried to get a picture. The first one was really blurry (and has a stain from the window I was sitting behind) but the second one is fairly clear (even though it's partially occluded by someone walking behind them). That whole "no socks" thing baffles me. How are their ankles or feet not getting chafed? growing up the only time I remember wearing shorts was for swimming and P.E. The first time I did PE in school I wore sweatpants. It was awkward and often hot during summer. This was around middle school years. I don't recall as much about my high school half-year PE but I think I did do shorts that time around. I think. I think we did have shorts or swim trunks for swimming though we'd still be wearing a shirt. That trait didn't last long once I was going boating or swimming on my own, particularly after I saw a friend who wasn't in better swimming without a shirt and I lost some of my apprehension about it.